How do I integrate my Store with UPS for Real-Time Shipping Calculation? Your 3dcart store can be integrated with the main shipping carriers in order to provide your customers with real-time shipping calculations for their orders. Integrating your store with some shipping carriers also allows you - the Merchant - to print Shipping Labels (domestic U.S. only) for your customer orders, directly from the 3dcart Online Store Manager. 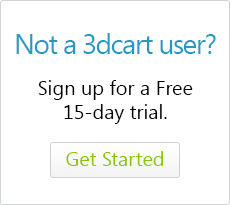 This guide will show you how to set up your account registrations with UPS and then integrate your credentials to your 3dcart store. When you intially open up your 3dcart store, it will contain some basic UPS shipping methods by defualt. However, it should be noted that the credentials used for these shipping methods are merely for display purposes only and may not be entirely accurate to provide real-time shipping quotes. Therefore, it would be beneficial to register your own UPS credentials and integrate them to your store before going live. Go to the UPS home page. If this is your first time at UPS, you may need to select your geographic location. Otherwise proceed to the next steps. Click on the New User" link located at the top of the page. On the next page, click the button labeled "Open a Shipping Account"
On the next page, click on the "Register Now" link located to the right. This information will be entered into your 3dcart Online Store Manager to allow your store to return Real-Time Shipping Rates for orders. Once you have registered your UPS account andhave received a UserID, Password and Account Number, proceed with the following steps to integrate them into your 3dcart Store. Next to the UPS section, click on "Enter Credentials"
Click "Save Settings" at the bottom of the page. During real-time shipping calculation, the store will send a call to the UPS api with the order's destination, origin and details of the order for a calculation. In order for this to work, the origin point needs to be in an area in which UPS offers service. Namely the U.S. Therefore, please make sure that your real-time shipping location is set to a U.S. Address. You are done integrating your Store to UPS and can now use Real-Time Shipping Calculation for USPS shipping methods. The above information will be sufficient for returning real-time shipping quotes for UPS shipping methods on your store. Even if your UPS account enjoys the benefits of discounted rates; the only information needed on your 3dcart Online Store Manager is the UserID, Password and Account number information. Real-Time rates will still be returned. However, if you are looking to also print UPS shipping labels from your 3dcart Online Store Manager, there are additional steps required in order to assign your account an XML Access Key. If this is the case, please submit a ticket to 3dcart Support so we can begin this portion of the process on your behalf. Please be sure to have your UPS UserID, Password and Account number information already in your store so we may retrieve them for the final steps. Once the XML key is generated on your behalf, our support team will send you additional information that will need to be sent to UPS to complete the XML Access Key integration.